Sick and tired of being an out cast having to go out side to smoke? Even in your own home. Tried other things to stop and nothing has worked? 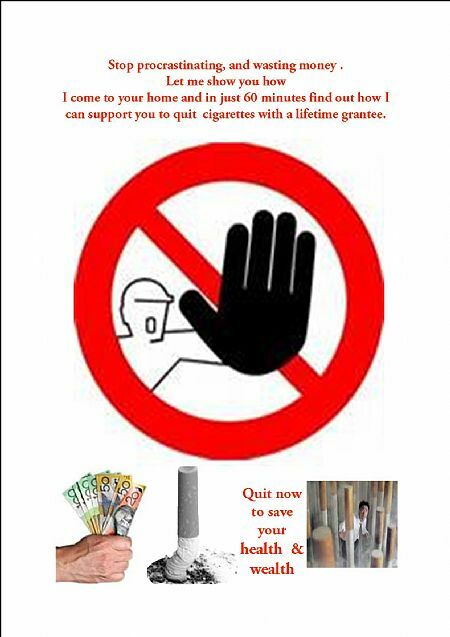 Worried about your health and others around you that are getting your smoke? Including your Pets. Are you ready to give up completely right now? Phone me now to find out how… or to send you a flyer. 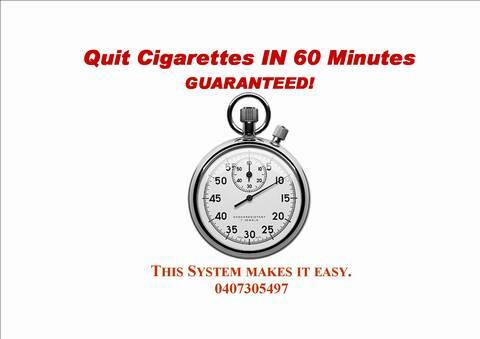 It only takes 60 minutes to quit cigarettes. Ask me now. I started with a taste of sweet sherry from a crystal decanter in mums cocktail cabinet, when I was about five. Early mornings after dad’s staff parties the previous night, would experiment tasting the left over’s. I haven’t drunk alcohol for over three years, I don’t have the cravings, and I will never drink alcohol again. What you did for me is amazing. You can help anyone, they only have to really want to and trust you. You can show anyone with any addiction to live comfortably without that problem. Now living in Perth happily with his wife and family.